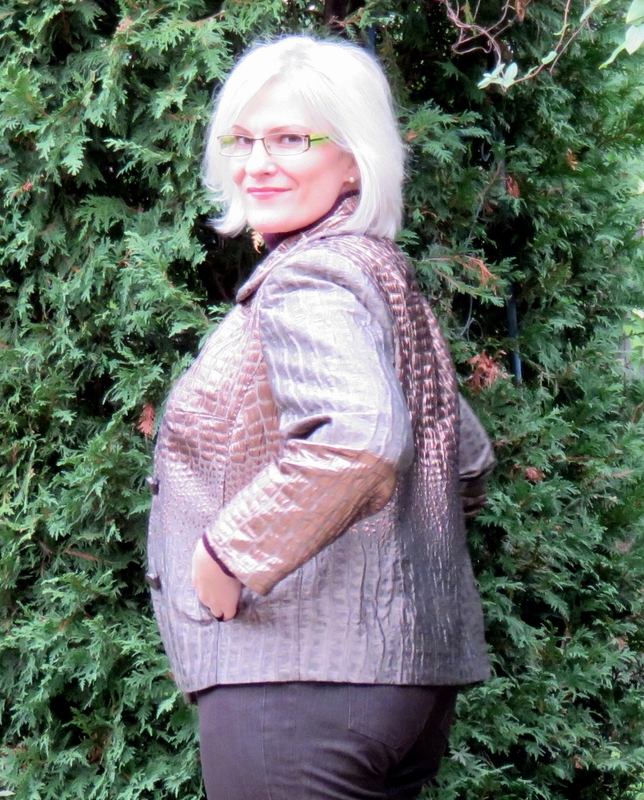 I can’t remember when I purchased this roll end from EOS, but I have finally pulled this gorgeous piece of matelassé from my stash to meet the PR Sewing Bee Round 3 challenge: a lined jacket. 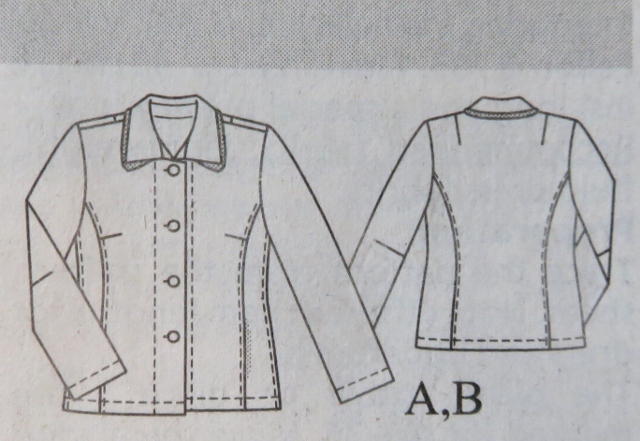 The pattern is Burda 08/2008 #127, an issue which I purchased for a different jacket a couple of years ago, and was pleasantly surprised to find this simple jacket pattern would – with some playing around – accommodate my limited matelassé yardage. I put the project into queue and forgot about it until now. 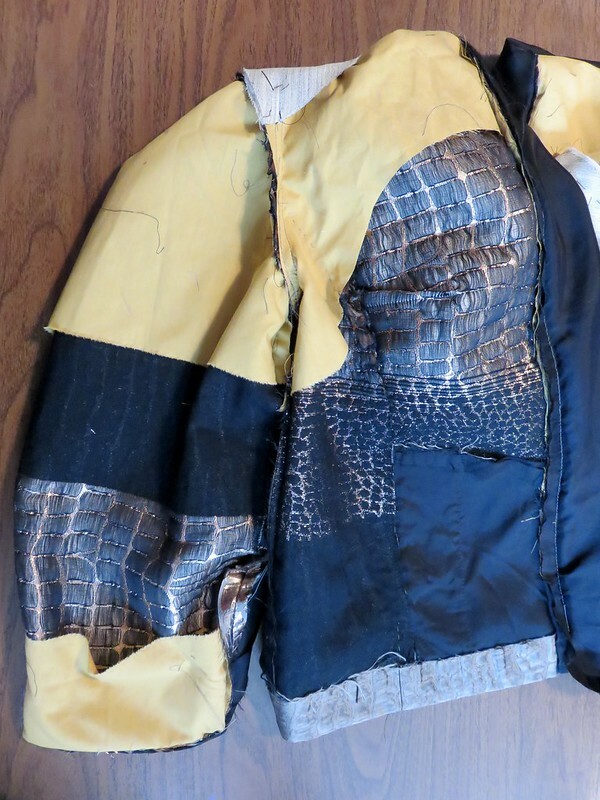 The jacket is designed as unlined, but I lined it. I did not have enough fabric for proper facings. As it was, I had to piece together the front edge facing and forego the extension into the shoulder as well as the back neck facing. 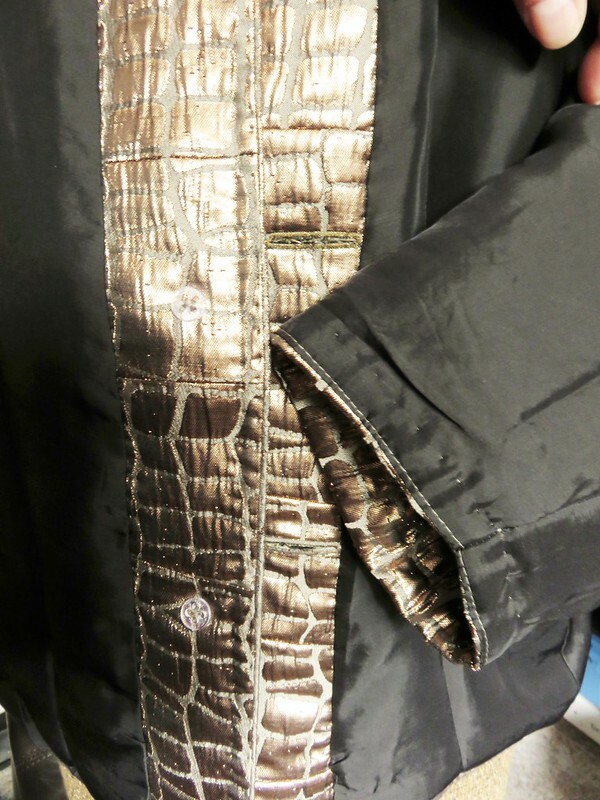 The sleeves are lined to the cuff edge. I have never worked with matelassé before, so this was a new adventure. My fabric made it a troublesome adventure because it was like sewing with two completely different fabrics. The matte part of the design was stable and behaved solidly like a quilted fabric – much like I expected matelassé to behave. However, the metallic portion was designed to be difficult, comprised of fluffy loose polyester fibres sandwiched between copper lurex threads and rather unstable black polyester threads. The lurex was incredibly flimsy, so I underlined it with pre-shrunk cotton/poly broadcloth. Then I realized topstitching by machine was not going to look so great, so everything was done by hand: understitching, edgestitching and topstitching. 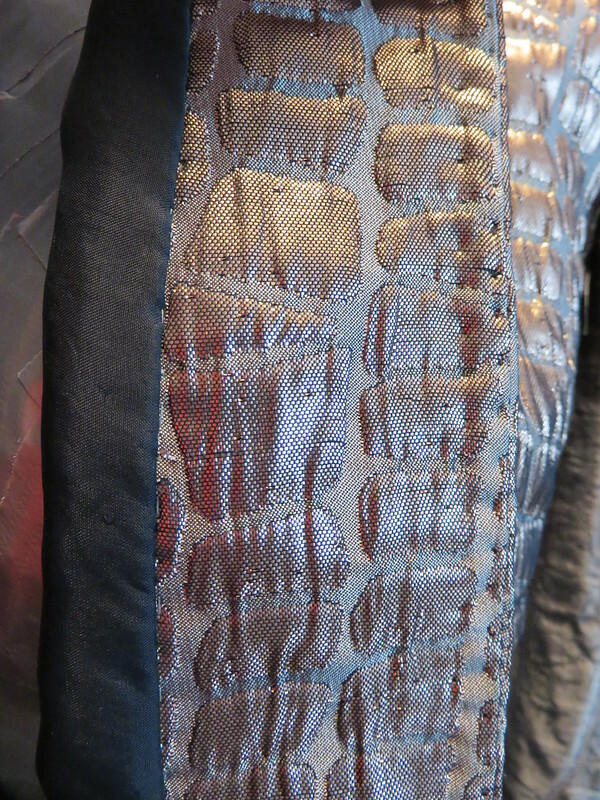 The hand work was relaxing, and I liked how it didn’t interfere with the fabric and finished the edges nicely. I balked at doing the buttonholes by hand, but they disappear into the fabric. 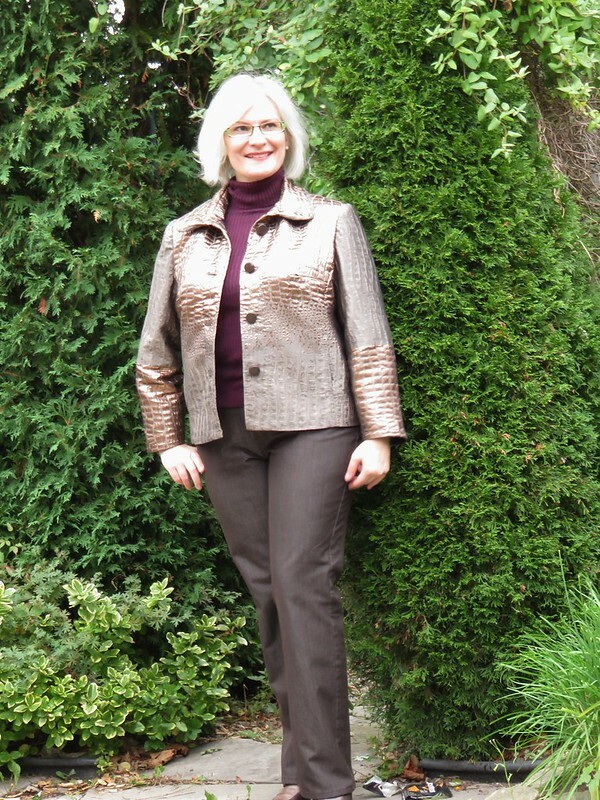 I was pleasantly surprised at how warm this jacket is, even with only a rayon bemberg lining. The roll end fabric repeat was a big problem. I’m not very skilled at good fabric design placement in garments (yet), and my roll end began and ended in the middle of one repeat. After going back and forth and shading in the line drawing several ways, I settled on the metallic gradation dripping down from the shoulders, and the clean stark line of it giving the illusion of deep cuffs. Just a note on the pattern. It’s a plus-sized pattern (44-52), and I’m so pleased with the fit of it. I made a very small (for me) 2cm (3/4″) FBA; cut the back and side back pieces as one to conserve fabric (incorporating the curved side back seams as a dart) and shortened the back waist by about 5cm (2″) by simply moved the centre/widest part of the dart up to where my waist sits. I did a 1.5cm (5/8″) forward shoulder adjustment and decided I’d put in 1cm (1/2″) thick shoulder pads rather than do a sloped shoulder adjustment. I felt the lurex matelassé could use the extra help through the shoulders. You can see more pictures of this project in my Flickr album, and read my PR review here. Another wow! This is beautiful and I think the effect of the pattern placement is striking. What a great outcome after so much thinking time and hand work. The cuff effect is so striking! Great fit and color for you too! Is that a binding on the collar edge? It is so nice being from the matte part. Yes, it’s a binding – on the straight grain, no less. The collar-binding seams are pickstitched together. It’s a nice touch, I agree. Not my idea! That is one serious fabric and you’ve used it beautifully. Thank you! I’m quite pleased with how it all turned out. That fabric is so cool, great job arranging the repeat! Thank you! Repeats are the one thing I dread working with more than anything else in a garment. I love what you’ve done here, and your pattern placement is spot on. This looks great, the style and colour really suit you. Lovely professional looking work too, very impressive. Thank you! The colours in this jacket are some of my favourite. Beautiful jacket! It looks a like difficult fabric to work with, but all your work was so worthwhile! The hand sewing made it ‘mine’. Oh… leather…. I haven’t quite got up the courage (or saved my pennies) for that….. yet…. Such a beautiful jacket. 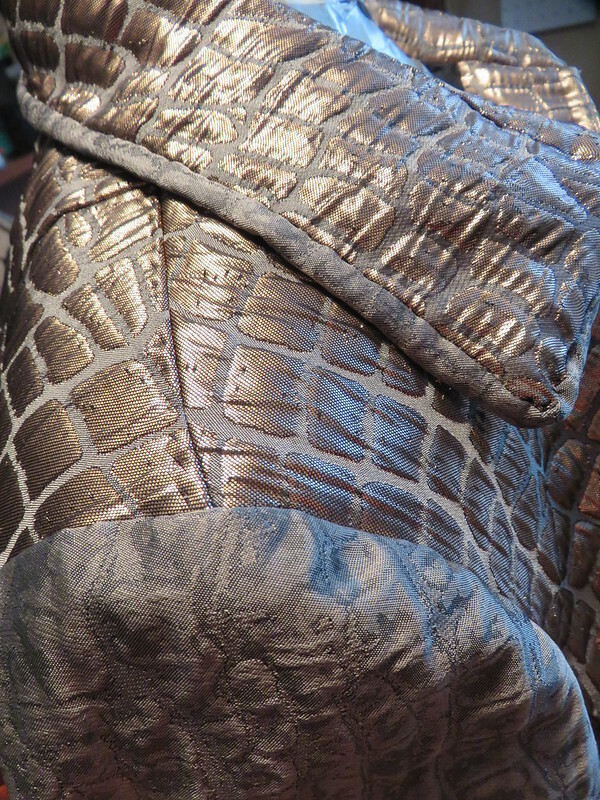 Your hand work looks so lovely embedded into such a lux looking fabric. I love me some hand work! Well worth all the work! Your fabulous fabric has made a striking jacket. Looks like all your efforts paid off with the fit and finish.